The TAG Heuer Women’s Specialist’s Watch Collection is one that all women can appreciate. Designed by Tiger Woods and intended to be the ultimate women’s golf watch, the Specialist line does carry with it amazing timekeeping abilities, but so do all of the TAG watches. The thing I love about these timepieces is that they look like they were made for a woman. 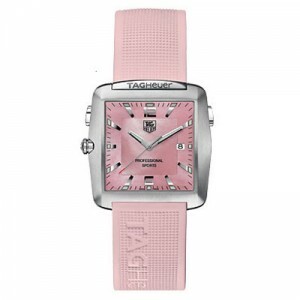 The TAG Heuer Specialists Women’s Watches offer contemporary design and fabulous detailing. It should come as no surprise to you that I have fallen for the pink one. 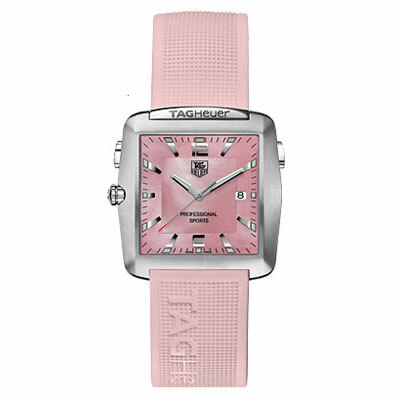 The TAG Heuer Women’s Golf Watch WAE1114.FT6011 is the one I’d like to highlight today. This timepiece is decidedly feminine and still quite exceptionally functional. It is crafted of strong stainless-steel and is water resistant to 99 feet. This watch is ergonomically designed for comfort and has been styled to meet all of the golfer’s special needs. The rubber strap is presented in soft pink and paired with a pink Mother-of-Pearl dial. The accents are silver. Both the case and bezel are crafted from stainless-steel, offering a strong and durable house for this watch’s Swiss Quartz movement. There’s no denying the stylish nature of this women’s timepiece. One look and you know it is high quality and elegant.